And note that Richard Muller's BEST project refuted all of Watts' claims. Oh my. Anthony Watts is letting his paranoia (and narcissism) show (archived here). He's noticed something in the sidebar at SkepticalScience.com and has decided that it signals nefarious intent. If you click on the link on the SkS image, you get to another page. 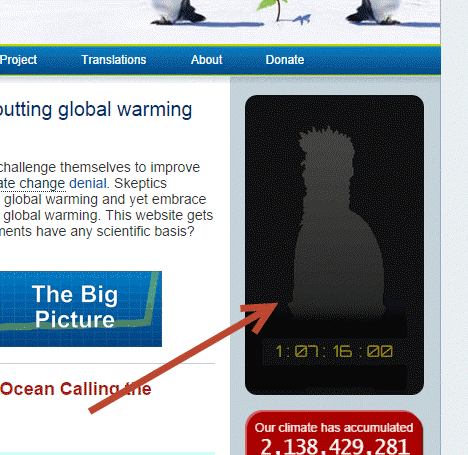 ...All of the silhouettes are greyed out now, but one can rest assured they be filled in with cartoonish caricatures once the countdown clock on the lower right reaches zero. Notice how Anthony adds some unsubstantiated statements. SkepticalScience is very proper and neither SkepticalScience nor John Cook gets into muckraking. They don't "smear climate sceptics". They don't need to. Fake sceptics condemn themselves by their own words. And why do you think Anthony doesn't give any examples of his allegations? It's because he can't. SkepticalScience is about reporting the science and showing why denier memes are wrong. Still, we'll have to wait another day and seven hours or so to see if he's right and if SkepticalScience has changed tack. I'd be very surprised if it has. It's committed to reporting climate science. It doesn't even allow ad homs, let alone defamation. While we're waiting, perhaps someone will deliver a message to Anthony Watts. Message to Anthony Watts: Anthony, it's some science deniers who are prone to skating too close to defamation. Not so much people who accept mainstream science. "These clowns" being scientists who were describing how they feel about global warming. Anthony is a tough antihero for whom feelings are a sign of weakness. Except when he's feeling brave but trepidatious and when he doesn't like feeling ignored. There aren't any yet. I'll update as they accrue. We've got a few, but none are as paranoid as Anthony's own article. Remember that nobody has seen what the teaser is about yet, so all comments are based on nothing but greyed out shadows of people. jmichna doesn't have a clue but decides whatever it is, it's bound to be childish. High school antics… sophomoric at that. Ought to be cute. First 100 victims of the climate holocaust? There are 99 figures there. I’ll bet they’re going to do something on the 99.99999% scientists believe in agw paper. leftturnandre implores Anthony to leave off the conspiracy theories and mudslinging and be daring enough to write about science instead. But it's clear he doesn't want Anthony to go overboard in that regard. He doesn't want WUWT to go as far as writing about real science, because he also thinks that WUWT shouldn't be promoting SkepticalScience.com. Probably he just wants some pseudo-science served up occasionally. SkS is way too sciency for the denier crowd. I don’t know if it’s wise to do this variation of feeding the trolls. WUWT gets a huge amount of traffic and ranks around 9800 in Alexa. SKS is a mere borderline phenomenon ranking in the 88,000 region. If you feed them with links they may grow. Also articles like these may be counter productively strengthen their adepts in the believe of the demonic character of sceptics. Don’t accept their war. Also maybe recognise that this type of polarisation is just early “stage 1 classification” in the accumulation to genocide. Take the high ground. Ignore them and stay friendly. A better alterative is concentrating on the science. Maybe my first blog could be inspiration. Humorous comments at link above. Sorry, anon, you know I really can't publish a comment like that.